BROOKLYN, NY- The Hudson Valley Renegades assured themselves of a postseason berth as they defeated the Brooklyn Cyclones 4-2 Thursday night at MCU Park. Their victory, coupled with a loss by the Auburn Doubledays, clinched a spot in the playoffs for the Renegades for the third consecutive season. Hudson Valley's magic number for clinching the McNamara Division Title has been reduced to one. It was Brooklyn who started the scoring for the second straight night when they pushed a run across in the second. Back-to-back singles from third-baseman Chandler Avant and centerfielder Anthony Dirocie to start the frame put runners at the corners. 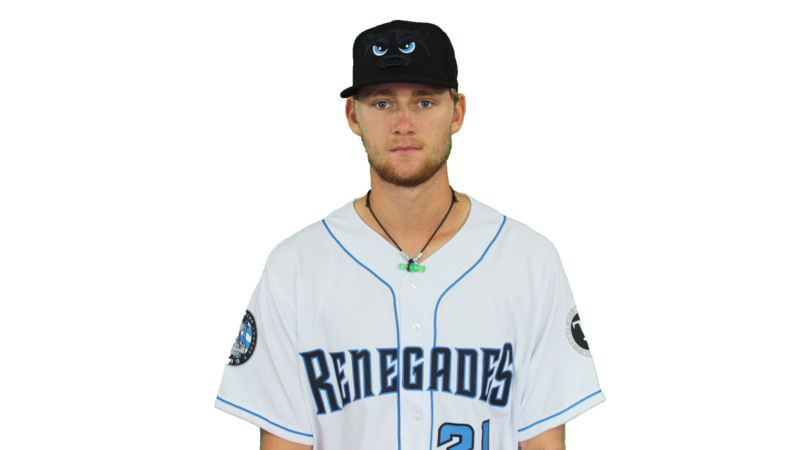 However, Renegades starting pitcher Easton McGee got catcher Hayden Senger to ground into a 4-6-3 double play to score Avant, but limit the Cyclones to one run. Brooklyn added another run in the fourth. With two out and no one on base, Avant bunted a single to third before Dirocie reached on an infield single to short to move Avant to second. Senger came up next and roped a single to center to score Avant and give the Cyclones a 2-0 lead. Things remained that way until the sixth when the Renegades put three runs on the board to take the lead for good. The inning started with a walk to shortstop Ford Proctor, and a single to center by catcher Erik Ostberg to put runners at first and second. With nobody out, first-baseman Jacson McGowan stood in next and ripped a double to center to score Proctor and move Ostberg to third. The next batter, third-baseman Kaleo Johnson, stood in next and lined another double to center to score both runners and push Hudson Valley ahead 3-2. The Renegades added an insurance run in the seventh. Centerfielder Tanner Dodson led off with a double to right. Two batters later, with one out, Dodson took off for third on a stolen base attempt. The throw from Senger went into leftfield, which allowed Dodson to score and up Hudson Valley's lead to 4-2. That is all Hudson Valley's pitchers would need. McGee (7-3) got the win after allowing only two runs on six hits over five innings. After he departed, reliever Alan Strong dominated the Cyclones by tossing four shutout innings of one-hit baseball en route to his first save of the season. The right-hander also struck out seven in the process. The loss went to Brooklyn starter Christian James (4-2) who allowed three runs on six hits over five frames. He also struck out five for the game. The Renegades collected nine hits and were paced by Johnson's 2-4 effort with two RBI. Hudson Valley also had three doubles in the contest. The Cyclones, meanwhile, had seven hits. Avant finished 2-4 with two runs scored, while Dirocie also went 2-4. Hudson Valley will go for the division title tomorrow when they take on Brooklyn in the finale of the three-game series. First-pitch is slated for 6:40. The Renegades will trot out southpaw Christopher Sanchez (0-0, 9.00 ERA) to the mound against righty Kyle Wilson (4-3, 3.42 ERA) for the Cyclones. Hudson Valley returns home Saturday for the final homestand of the regular-season when they take on the Aberdeen Ironbirds in the first of a three-game series. First-pitch is slated for 6:05 and there will be fireworks following the game. Tickets can be purchased online at hvrenegades.com or by calling the ticket office at 845-838-0094.